Apologies for a second successive blog on asbestos, and it’s going to get a bit techie; but the numbers are big and scary – and they’re very relevant to ships, hazards and recycling. Talcum powder is lovely, we all know that. It makes babies dry and happy. Puff it all over, put it under your armpits, on your feet, in your undies if you want. Clouds of it everywhere – wonderful! Except for the asbestos that might be in the talc, of course, and that it might cause cancer. Big, big numbers; today, here, now. Which leads to the question: What do baby powder and cosmetics have to do with ships? Talc is possibly present in large quantities onboard ships and is completely unregulated by the IMO Hong Kong Convention and the EU Ship Recycling Regulation. It is used in paint, gaskets, packings, plastics, and electrical cables. It’s found in ceramics, and even in food and pharmaceuticals. In many of these applications, such as paint, plastics and cables, the talc is well bound within the item. However, in others it is not. As ever the problem is uncertainty, otherwise talc would simply be banned, and this uncertainty surrounds three areas: Description; contamination; danger. Talc is a sheet silicate; a phyllosilicate-like white asbestos, and a silicate of magnesium just like brown asbestos. This is another example of how misleading simple mineral descriptions can be. The talc we’re familiar with is a very soft platy item which is flexible and slippery to the touch. However, it fragments and can be fibrous. Minerals develop differently as the crystals grow and are influenced by the surrounding temperature, pressure, and other elements, molecules and minerals. The problem being at the extreme end of its behaviour, under some descriptions, talc can have an asbestiform habit – in other words, it can look like asbestos. ‘Anthophyllite asbestos altering to talc, upstate New York’. Talc seen ‘on end’ might seem fibrous. However, asbestiform talc forms when talc plates elongate to form true ribbon like fibres. These may have an asbestiform habit with bundles of narrow fibres. Some talc mines contain less than 40% talc and more than 50% tremolite and anthophyllite (both minerals that can be asbestos), and analysis shows that these contain many particles which fit a simple geometric description of asbestos (length and aspect ratio) but on more detailed analysis are found to be asbestiform talc and fragments of the potential asbestos minerals rather than asbestiform types. So, clearly, description and definition of talc is a problem. The same website provides a link to a 74-page document that tabulates the various descriptions and terminology related to defining asbestos. The document describes itself as ‘incomplete’. If you can’t define talc, and it might be confused with – or ‘alter to’ – asbestos, how do manufacturers know what they are using, and how do testers know what they are testing? Although talc seams can be very rich, they can form under similar conditions as asbestos and can therefore be contaminated with asbestos. A common contaminant is tremolite. 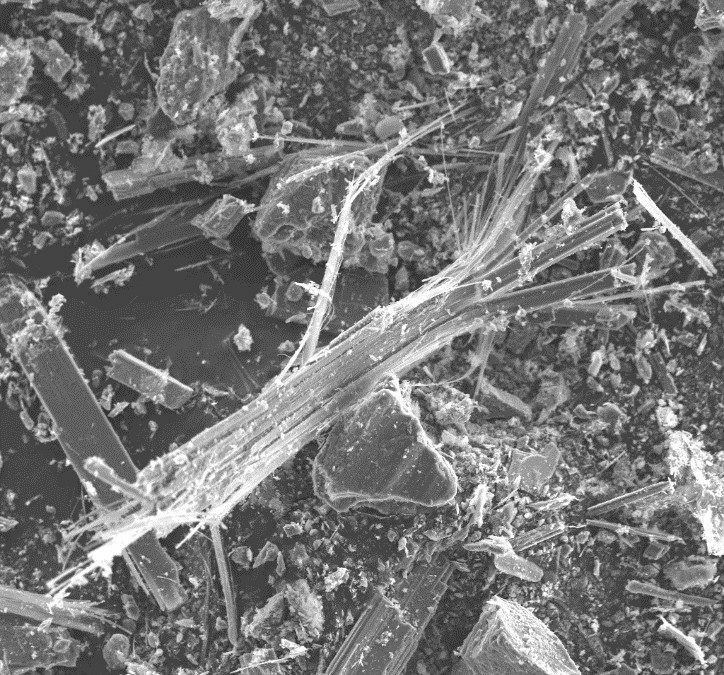 This can be a particularly nasty form of amphibole asbestos and is not only common in many mixed minerals, but also often found in unexpectedly high quantities in lungs of people who have died of lung cancer or mesothelioma. The potential for asbestos contamination in the areas where talc is mined has led the industry to declare two or more types of talc; industrial talc and cosmetic / pharmaceutical / food grade talc. This is interesting, since it seems to acknowledge that there is ‘bad’ talc and ‘good’ talc, and it’s ok to use ‘bad’ talc in industrial applications. Marprof can certainly see the logic in not smothering babies in asbestos-containing talc, but we’re not sure where the logic of allowing potentially asbestos-containing minerals industrially applies. Presumably some sort of economic logic is applied – the historical economic logic which works fine until problems are noticed and the courts start changing the economic balance dramatically. In the globalised world, once you allow the concept of ‘industrial’ talc, then different countries will allow different levels of contamination, and the global supply chain will become less reliable. Unscrupulous dealers will seek cheaper and cheaper sources of both good and bad talc and will mix bad talc into good talc to boost profits – or just label bad talc as good talc and sell it on anyhow. You get asbestos in baby powder and cosmetics. You get asbestos in fitted equipment and machinery onboard your ships. To sum up the talc situation for ships, there are many places on ships where it may be found. It can look like asbestos. It can ‘alter’ to asbestos. It can be contaminated by asbestos. We can’t define or describe it accurately. It may or may not be dangerous. The only certainty that we have is that it causes immense awards in US litigation.